Ninigret Oysters are raised in the clear, clean waters of Ninigret Pond By Oysterman Rob Krause. His hand-selected oysters are famous for their "Sweet & Briny" flavor, with a sweet finishing taste! Ninigret Oysters Are Raised in the Clear Clean Waters of Ninigret Pond! These hand-selected Oysters are famous for their "Sweet & Briny" Flavor, with a Sweet Finishing taste! Ninigret Oysters are on average 3" long and come 6 per order! 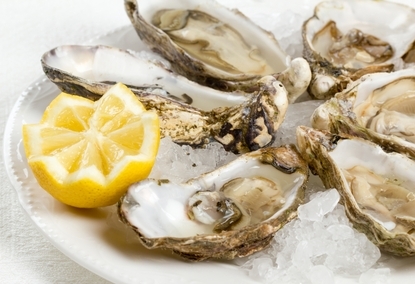 Order Fresh Oysters By 10am EST, And Enjoy Them For Dinner Tomorrow! Oysters Also Make A Great Gift Idea For Your Favorite Seafood Lover! How Easy Is That! congrats to the men harvesting these! They are excellent and fresh! We will order more for sure. Lovely oysters! we ate one order on the half shell, and the rest we broiled ala rockafeller! Yummy oysters Tim! Grace & Ted from Fla.